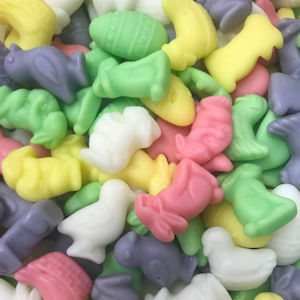 Home / Products / Seasonal / Easter Candies & Pops / x-Gummi Chicks and Bunnies, 1 lb. Corn Syrup, Sugar, Cornstarch, Dextrose, Artificial Colors (Yellow 5 & 5lake, Blue 1, 2 & 2 lake, Red 40 & 40 lake), Color added (Carmine, Titanium Dioxide), Citric Acid, Natural Flavor, Coconut Ol, Carnauba Wax. The product man contain Milk, Wheat, Peanuts, and Tree Nuts.